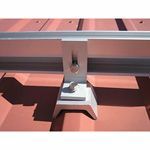 The SnapNrack PV Mounting System is a line of solar racking specifically designed to reduce installation time. The SnapNrack system incorporates major technical and production advantages to simplify and reduce the cost of solar installations. These products are designed to be simple, adaptable, and strong. All SnapNrack products are covered by their 10-year warranty. The SnapNrack Standoff Kits are engineered to ensure maximum standoff adjustability for a clean, level installation on the most irregular roof surfaces. Every roof penetration gets a full metal flashing to ensure worry-free waterproofing for the life of the system. To be used with the Standard Series 100 Roof Rail with corrugated metal roofs.